Carver’s commanding lineage shines through in its C52 Command Bridge. 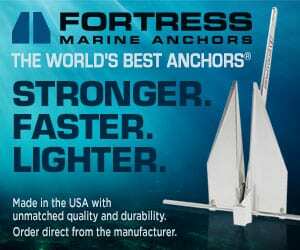 Through the years, many boat builders have come, and a number of them have gone. Still others have withstood the test of time, remaking and reinventing their brands to maintain their lineage. 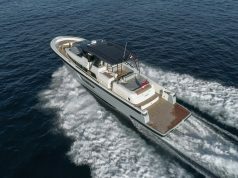 From humble beginnings of crafting mahogany planked runabouts in the mid-1950s to their latest offering, the C52 Command Bridge, Carver Yachts is still building pleasure crafts for one reason—to go boating! As evidenced at her Miami debut in 2016 by the throngs of people waiting to get on board, the Carver C52 invites you, nay, begs you to come closer. From the generous freeboard that beats down the seas to the unbroken sheer of her profile to the hull side windows that enlighten the sub-dwellings, you know that you will be enveloped by a cruiser that knows how to handle herself. The broad expanse of the Carver C52’s hull yields large interior spaces even into the lower staterooms. 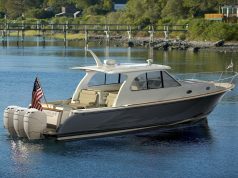 With a main deck that sits a tad lower into the hull, the C52 retains a sleek low profile, accented by the raked-back windshield and low-slung radar arch—a look that’s ready to go. With the C52, boating is the mission and Carver delivers. Relax on the aft deck U-shaped settee, perfect when cruising the ICW, keeping an eye on the kiddies swimming when at anchor or enjoying a meal alfresco. Or head up the wide side decks to the bow’s oversized chaise seats. These are twin cushioned seats separated by a console that contains drink holders and stereo controls. A great location to kick back and enjoy the cruise. As mentioned, the walkaround decks are wide, with full railings and grab rails along the house to make the transit safe and secure. Carver styles the C52 with an eye towards simple elegance and ease of use, which really equates to ultimate enjoyment. For example, the galley is located aft in the salon, but when the aft glass doors are folded all the way back to join the aft deck with the salon, the galley now becomes the center point. With guests and family on board, the chef is not relegated to a dungeon galley but remains right in the mix. Socially, it works. A simple layout along the port side, the galley is fully functional with a complete package of appliances that includes a flat, two-burner Whale electric cooktop, built-in Cuisinart microwave convection oven, under counter Nova Kool fridge/freezer (a second unit is across in the entertainment center), stainless sinks with covers, and about a mile of counter space. Creative space utilization is proven with the garbage receptacle—an angled pull-out rack with pail housed in the caddy-corner entertainment center. Forward is the raised salon, and with low-profile but ever so comfy seating on both sides, it becomes another favorite spot to chill and take in the views or catch a movie on the 40-inch TV with Polk sound bar speakers that add a new dimension to theater systems. On this model, the contrasting dark wood flooring against lighter furnishings offers a nice combination for adding to the open feel with a touch of panache. A hi-lo pedestal dining table is to port with the C-shaped settee. The big draw on the Carver C52 is the Command Bridge with the choice of an open bridge or integrated hardtop. 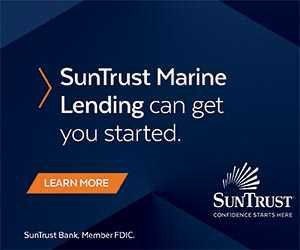 I was impressed with the hardtop model and its solid construction and mounting as well as the ability to enclose the bridge for HVAC environmental control. A full molded-in staircase makes transiting to the bridge an easy feat. Enclosing the bridge solves another issue: You won’t need a lower helm station (although it is an option). 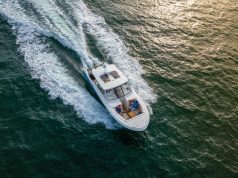 The upper station is located to starboard and has ample room for two 12-inch Raymarine chart/radar displays as well as the 7-inch VesselView7 engine monitoring display. With breaker switches to the left, engine controls and Cummins joystick controller to the right, everything you need is within reach. In addition to the bolstered helm seat, there’s an L-shaped settee to port that not only faces forward but also has a side chaise lounge that faces aft. You can choose to sit sideways—a nice combination for the cruising couple or for the kids to enjoy the ride. Just aft on the Command Bridge is a grill station set up with a sink/faucet, Kenyon electric BBQ, Norcold fridge, and storage space. Picture yourself on the hook, grilling some burgers, having the kids in the water, and enjoying time with friends. It doesn’t get much better. Finishing out the bridge is a large U-shaped settee aft with soft backrests and a high-gloss teak table. Carver designed three staterooms into the Carver C52 with a little surprise. Forward via a center staircase are the VIP and guest staterooms. The VIP is in the forepeak with a centerline island queen berth accented by five overhead lights, rope lighting in the soffit, reading lamps, and ambient light via the deck hatch (egress here). Hull side windows enhance the view. Shelves, drawers, lockers, and storage compartments abound. An entertainment system with a 19-inch LCD TV, high-gloss black cherry finish with vinyl accents, textured panels, and 6’6” of headroom make the VIP feel like the master. A guest stateroom is to starboard with twin berths, overhead and courtesy lighting, opening port, and nightstand. An optional washer/dryer can be fitted into the closet. There’s an optional crew quarters aft, but the Carver C52 may not need crew, so save this as an extra bunk or storage space. The aforementioned surprise is that the master has a private access via a staircase in the salon. It’s a destination of its own thanks to the mid-ship full-beam configuration. “The privacy, the amount of space, the accommodations, and comfort of the master stateroom and head set this boat apart and continue the legacy Carver has established since its beginning—livability, space utilization and your home on the water,” says Kelly Kraning, Carver National Sales Manager. Hull windows allow light to flood in, highlighting the center queen berth and side chaise lounge seat. A high-gloss cherry wood finish complements the textured headboard and various materials used on the walls and ceiling. Eleven overhead lights, soffit ropes, accent and reading lights, and table lamps allow for any mood. The ensuite includes an enclosed shower stall with glass door. A Tecma freshwater head, vessel sink, and ample storage have you covered. With the bridge curtains open, we put the C52 through the paces. It’s surprising how well the windscreen venture helps the wind to run up and over your head when seated at the helm, allowing for near-regular conversation. It also helped that the Carver C52 with a pair of Cummins QSC 8.3 600-hp engines were quiet, too. Sometimes it’s important to get back to basics, like boating with friends and family and enjoying life. 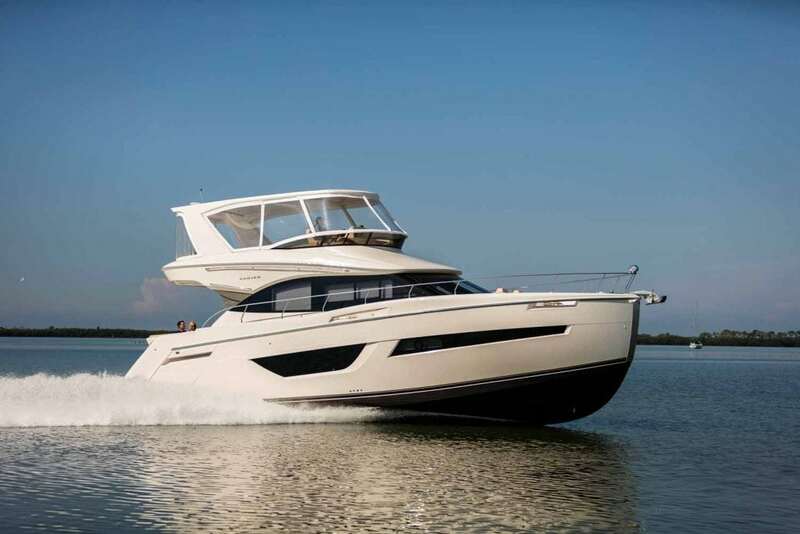 The Carver 52 Command Bridge allows you to do that and have the time of your life. Carver’s 52 Coupe retains the same features and layout through the main deck, including a three-stateroom layout below. Added in are a lower helm station, electric sunroof over the salon, aft skylights, extra aft deck seating, and electric awning. A low-profile radar arch accents the sleekness of the Coupe’s style.